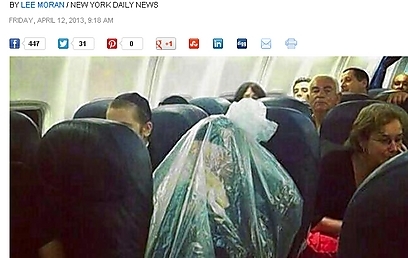 The ultra-Orthodox man who was photographed wrapped in a large plastic bag during a flight told Ynet on Sunday that he was "simply following my rabbi's orders." The picture caught the attention of international media, as initially it was thought that he was distancing himself from women in accordance with strict rules of gender segregation in public. The New York Daily News later explained that the man was a Kohen, a descendant of the Jewish priests who presided over the Temple, and as the aircraft flew over a cemetery he covered himself in a plastic bag so he could remain pure. Under Jewish law, Kohanim are banned from going near cemeteries. The Kohen, formerly a secular Jew who embraced Orthodox Judaism and asked to remain anonymous, told Ynet of his long service in the Israel Defense Forces, where he held sensitive posts. In 1983, as a show of appreciation, the Air Force commander gave him the "opportunity to study in a yeshiva at the expense of the Air Force, which paid my salary for the two and a half years I studied in the yeshiva." After his studies, he returned to the army for 10 more years – "an unprecedented move in the Air Force," he says. The photo was the subject of public criticism and was shared and condemned on social networks. Rabbi Yosef Brook, head of the Netivot Olam Yeshiva and the passenger's rabbi, criticized the media coverage of the photo and the public reaction to it, saying: "I am convinced that none of those who reacted is at (the Kohen's) personal or intellectual level." Rabbi Brook, who heads a haredi yeshiva which is home to newly religious Jews, says that the passenger is a unique personality he has known for more than two decades, and that the halachic move was misunderstood by the critics, who he refers to as "primitives". "I have known him for 25 years now. He is a retired lieutenant colonel who served in senior and classified positions in the Israel Air Force," the rabbi told Ynet. "Before Passover he flew to Israel, and because of a change in the flight he found out that he would be flying over a cemetery. He consulted a rabbi, who ruled that although the plane was a closed place, there was impurity over the cemetery and in order to deal with it – he must reach a situation of a 'container with a lid fastened on it.'" According to Rabbi Brook, what the public may have seen as an attempt to "bypass" Halacha using tricks – is Halacha itself, and so he "advises people to consider how they would feel if their values made others give them degrading and puzzling looks. "Once again, the familiar scenario repeats itself: Any issue related to Jewish Halacha turns into a festival of defamation. Anything related to cultural heritage, which is not understood, leads to a mocking and slandering attitude. The rule says that the more you know less, the more you shout, and this is what happened in this case too. "If a person from the Zulu tribe would see me talking into a telephone, he would think I had gone mad, because he can't understand how sound waves can travel hundreds and thousands of kilometers. He has no understanding of electromagnetic radiation either, because he can't see it with his eyes. "The same way, there is also a spiritual system of impurity and purity, and we don’t have the ability or tools to identify its activity. So I say to the the critics, if you have no knowledge about the issue, do us a favor – leave us alone and treat us kindly and politely. "Just like people understand Muslims who take their shoes off before entering a mosque and don't ridicule them, just like they understand that Christians remove their head cover while entering church – treat Judaism with a minimum of respect." The Kohen who "starred" in the picture told Ynet that he had studied with the Belz Hasidic movement, "considered a human and moderate Hasidic dynasty, where I studied Torah and faith and was close to the rabbi. "I also studied at the Netivot Olam Yeshiva, which is an organized institution where respectable people study. Four other combat pilots studied with me there. At the time, as a newly religious person, I even had the honor of being an associate of Rabbi Shach (a leading Lithuanian rabbi and the founder of the Degel Hatorah political party)." See all talkbacks "Man in bag: I was following rabbi's orders"